allow to reclassify mail from the list. js error in timeslot add when drawing user combo and logged user doesn't have "can_manage_time"
Change value "Serie" to plural for keys "series" and "field Object series"
Expense totals fixed when ordering by a dimension column. cant add tasks with advanced_services and  not using time in date pickers. dont filter files by their associated mail if they are classified. dont set the font size in ckeditor's contents.css body rule. search input in tickets module. config option to exclude associated dimensions from general breadcrumbs. invoicing module: allow to set client address and city fields as mandatory when adding an invoice. advanced_services: allow to define works shift days as dat off. advanced_services: config option to define the hour type member for days off. action to generate first repetitive instances for tasks. several improvements in grouped custom reports. start timeslot from without task. allow to specify end date and time when adding a timeslot. task list group by member type. allow to disable custom report parameter when running the report. new timeslot list in tasks view. allow to specify paused time when adding a timeslot. new group by: dimension intersection. limit mails search critera with a minimum of 3 characters. permissions, users can't see documents if they can't see the mail related. check that class exists before executing "eval()"
dont show associated dimension's member history widget. unescaped names in time module. task asignee notification on templates. in object view the custom properties repeats last value if is empty. some dimensions members are not selected when clicked in breadcrumbs. if dimension is hidden the members are not selected when clicked in breadcrumbs. the contact associated to the client is not classified in the client's related members. breadcrumbs are not showing the members of the dimensions that have its selector disabled and they are autoclassified. template tasks subscribers and assign to permissions. Double quotes are not correctly escaped in custom properties description. member templates: ensure that new member is in context before rendering the task template paramters form. timeslot quick add does not show all users with read permissions on timeslots in the user selector. when assigning client permissions deleted user permission groups appears in selector. when copying expenses the payments are not copied. attachments inside other attachments cannot be downloaded sometimes. user token is not removed when disabling user. in listings when adding a custom property as a column and is not visible by default the system does not remember the users' choice. tasks list group by person filters different than assigned to, are not shown when loading the list. error when filtering tasks list by milestone. report group by date columns was not applying timezone. when printing/exporting grouped custom reports only the current page is shown. group order in tasks workflow definition. not all birthdays were shown in calendar's full week view. make hierarchical all dimensions in crpm_types plugin. member tool to change its dimension. new condition type to check the availability of users in contact custom reports. advanced services: render time amount config options as hour:minutes. templates: add fixed time when assigning vairable "date of task creation". user preference to show the inactive users or not in the contacts list. add invoice description to the preview. advanced services: work shift break configuration and usage when calculating automatic timeslots. advanced reports allow to include comments below each object line. member relations history, tab in edition and widget. put client/project/workspaces/tags lists in a fixed tab. separate timeslots classification from its task. timeslot custom reports new column "paused time". advanced services: generate first repetitive instnaces when creating a repetitive task. advanced services: new member type - station in crpm dim. advanced services: automatic split of timeslots by hour types. advanced billing: allow to specify more than one member for each billing category dimensions. advanced billing: modifications for timeslot reports and generation. advanced billing: billing cat with conflict timeslots in a separate section and allow to make custom reports. set color to mails panel filter buttons when filtering mail listing. set color to current mail folder in mail listing. adv. mail: allow to select more than one account in the mail account filter menu. config option to allow or not multiple lines in invoice line description. advanced billing categories list does not filter by context. template tasks does not copy the repetition options added in plugins to instantiated tasks. repetitive tasks generated from templates are not chained correctly with the rest of the repetitions of the same instantiation. prevent use of browser cache when downloading files. when completing a task and the wokflow changes the project/client status the member status history is not saved. phone number form component shares variable with other phone components and causes malfunction when adding new phones in contacts. breadcrumbs displayed near name on object lists. assigned to logged user by default when creating task from email. when editing timeslot starting at 12:00 am and depending in the timezone of the user, sometimes it adds 24 hours. permissions error when trying to view a document associated to an email. when instantiating templates the permissions are not checked for the assigned person. general search is checking permissions for super administrators. when trying to complete task with uncompleted dependencies the notification is sent anyways. list custom property values are not shown in object view. custom properties config to hide in listings is not working. when tying to classify in a member where you don't have permissions the system doesn't tell you that the object was not classfied. when you press 'check mail' it tells you an email has been received but it doesn't show up in your mailbox. You have to refresh the mailbox. ensure that the last_uid_in_folder is updated correctly always. mail paging toolbar is disabled after search. js error when custom dimension names have single quotes. template tasks instantiation: conditional tasks with subtasks does not create the subtasks correctly. when email attachments are parsed as "Related" they are not included when forwarding. when email is classified only in dimensions that doesn't define permissions and user is not the mail account owner, the email cannot be reclassified. object_id is not saved in sent_notifications table. click in mail subject, from, to and open link in new tab doesn't open the email. when downloading image it is an inline image of another document or an email attachment then check the permissions of the container doc or email. when email type is text/calendar the ical file is not parsed. reload all tasks modified when editing a task and affecting other instantiated repetitions. sometimes associated member selectors are filtered by current context. timeslot reports replicates task columns. reporting - group by three criterias, in the third sometimes generates separated groups for timeslots in the same group. sometimes click on email opens it in a new tab. invocing module: credit notes must have at least one reference. create member templates from received emails. allow to separate clients and projects columns in tasks list. add checkbox to select all object types in permissions definition interface. adminsitration users list using paginated grid filtering by active, inactive or all. new action "Classify only attachments" in email view actions panel. In event view, if event time zone is different than logged user time zone then show the original time with timezone below the calculated time for the logged user. multiple currency integration with invoicing, expenses and advanced billing. mail list - icon to show if it has been replied or forwarded. add fixed totals for invoices. allow to totalize content object's fixed numeric properties. separated list totals for each defined currency in expenses and invoicing. ensure that notifications always has something in the from name. dont send notifications if demo_web plugin is active. inherit company addresses and phones in contact reports if contact doesn't have any. dont show payments table when editing expense. mail rules that forward text mails does the forwarding as html. sent emails imap synchronization fixed. gantt task dependencies not rendered. delete mails from server fixes. mysql scape on mail list query. templates with tasks and subtasks that are generated through conditional actions does not generate the subtasks correctly. export ticket custom reports to csv and excel does not change the html entities for the characters in the description. missing lang in tickets custom report columns. in contacts view - don't show job title data if the custom property is disabled. sometimes when send email btn is pressed it saves a draft. email download performance when trying to request emails that are not in server. sent email message_ids are not saved in mail_contents_imap_folders. when viewing mail its read status is not always reloaded until the complete list is reloaded. missing langs in tickets notifications. added constant to disable verify_peer and verify_peer_name when sending emails using ssl/tls and using php >= 5.6.
in gantt if a task is in more than one group it is shown only once. missing lang in project types when the association is multiple. associated member selectors js error. after selecting first multiple associated member you need to click outside and then inside the textbox to load the list. disable multiple lines in invoice line description. change delete member js prompt for a custom modal to avoid the browser to remember the last answer. make advanced_core a pre-requisite for expenses plugin. member listing group by "located under" column fixed. when clasifying emails it was always clasifying all the conversation without looking the preference that defines that. breadcrumbs in emails must not be shown next to the subject. 'created_by_id' in where clause is ambiguous' on calendar widget. email parser was not recognizing attachments in multipart/related content. missing lang in deleted emails notifications. performance of search component within the mail tab. error in advanced reports when grouping by created by. imap check mail function fail when last received mail was deleted from the mail server. imap checking fixed when last received mail is not in server. custom dimension name not used in associated dimensions. send mail sometimes saves draft. error parsing Message-ID from mail. unable to set can_update_other_users_invitations and can_link_objects permissions value. imap download mails from specific date. ambiguous column error when object subtype plugin is active and user group tasks by a date field. mail contents - imap folder association normalized. if sandbox defined then don't use the purifier to edit html documents. when downloading an email whose "from" is marked as "no spam" it is sent to spam folder if has spam level headers greater than the configured level. crpm types dimensions are not shown in separate columns. not all tasks are included in monthly view if they are too many. don't save same email more than one time if it belongs to more than one imap folder. don't send reminders for template objects. if contact/company links doesn't have scheme they are treated as relative urls. check negative spam score when saving mail. in notifications subscribers section, the last two users are not separated by spaces. don't show company name between brackets for companies. don't show add task form if user doesn't have permissions to add. custom reports not filtering by created on. contacts listing order by last updated fixed. when user triggers email dowload and has no permissions over the email rule's members the email is not classified there. custom reports error when conditions uses "is_user". email addresses are not shown in custom reports. performance upgraded when grouping custom reports by dimension member types. in contacts list when clicking a company goes to other view. email custom reports fails when using "to" in conditions. tree panels wrong ordering with lower/upper case members, also with characters with accents. user without delete permissions cannot edit file revision comment. when user does not have the "can manage tasks" permission and completes a task an error message is shown after the completion. expense list and payment list totals does not use standard functions. expense and payment reports are not including totals. in member custom reports, when adding a list custom property condition the possible values are not loaded correctly. in grouped custom reports when a task is in more than one group then the hours are modified twice by the timezone. upgrade script was setting version to beta. bugfix: if user does not manage permissions then don't let to create members without parent, otherwise no one will see it as user cant assign its permissions. bugfix: cut user permissions when changing role must be done only if downgraded and executed in background when possible. feature: expenses plugin: show previous status amounts in listing and view, show payment history in expense view. bugfix: dont use JSON_NUMERIC_CHECK constant if not defined (is a php predefined constant). bugfix: member cache construction function fixed. bugfix: fixed object classification after changing member parent. bugfix: check mail error when emails uid change on the mail server. bugfix: cannot enable email module if it has been disabled. bugfix: email address length is too short. bugfix: users cannot see other users contact cards if they have a higher role. bugfix: mail list is not reloading if viewing an email and changing context. bugfix: create contact from email when sending email was setting user fields. bugfix: additional member permissions - sometimes the checkboxes are checked and the permissions is not set. bugfix: get_member_childs function for member tree. performance: multi tasks action remove member aditional data calculation. bugfix: instantiate template from email is not working properly. bugfix: add member custom properties tab render error. bugfix: error on object list when sorting by custom properties or dimensions. bugfix: comments widget not working. bugfix: prevent json errors on members list. bugfix: do not check permissions for super admin on archived objects list. bugfix: users can view other users with lower rol if they don't have can_manage_security. bugfix: classification error on user edit form. feature: allow to edit precharged subejct and body variables when instantiating a template from an email. feature: allow all day events container to be expanded to show all items. feature: mails panel, when filtering by unread, dont remove mails immediately after marking as read, remove them when leaving the tab or opening an email. feature: constant to remove help links in settings. bugfix: in mail list when several requests are sent to load the list (different filters) only the last response must be loaded. bugfix: when classifying from mail view always return to first page. bugfix: if template parameters has name with capital letters and are saved in lowercase (if browser sent them in lowercase) the parameter is not applied. bugfix: if sunday is a working day, 5 days calendar view should start in sunday. bugfix: encoding error in general search. bugfix: show all childs in memeber trees after expand. bugfix: cannot advance to second page of projects list. bugfix: mail panel grid selections doesn't work fine after marking mail as read and filtering by unread. bugfix: single member selector does not show filter input in chrome. bugfix: performance improved when checking for new emails. bugfix: tasks toolbar complete button does not prompt to complete subtasks. bugfix: remove rows from mail list when mail is deleted. archived, classified in other place, etc. bugfix: only admins can change timeslot person. feature: allow to add/subtract minutes of date variables in task templates. bugfix: members list custom properties columns, disabled custom properties must not be shown. bugfix: when template adds more than one day to a date variable and the resulting date is a non-working day then that amount must be added to keep the gap. bugfix: add subtask from task view. bugfix: when submitting comment disable the button to prevent double comment if pressed twice. bugfix: email list performance improvements. bugfix: breadcrumbs does not appear in expenses report the first time it is executed. bugfix: webpages display issue in contacts view. bugfix: tasks list grouped by milestones, if showing empty milestones, when adding/editing task, it is replicated in all emtpy milestones. bugfix: change 'null' for '0' in plugin_id column in installer initial data quieries. bugfix: cannot instantiate template from mail if template has no variables. bugfix: in some languages somtimes the messages widget crashes the overview. feature: filter by type in archived objects, trash panel and overview list. feature: member info widget improved. feature: objects subtypes plugin, allow to define different types of notes, tasks, etc., each one with different sets of custom properties. feature: custom properties interface improved. feature: expenses - allow expenses report to be exported to csv. feature: expenses - definition of different type of payments, each one with different sets of attributes. feature: expenses - config option to allow to add negative amounts. feature: add to listings the possibility to order by custom properties and dimension members. feature: don't persist attached documents after sending the email. feature: allow to filter time report by associated task status. feature: when completing a task show popup to ask if user wants to complete subtasks too. feature: allow to set user when adding worked time from tasks list. bugfix: when editing an object, don't modify linked objects for objects that logged user doesn't have permissions. bugfix: when editing an object, linked objects are not instantly loaded in the form. bugfix: add/edit mail account - sent emails imap sync fields are not shown in a tab. bugfix: don't show non manageable dimensions in object view (except for clients). bugfix: view/edit company without logo shows person default image. bugfix: when changing company logo it doesn't refresh the preview. bugfix: company logos are not shown in contacts tab list. bugfix: when all sizes pictures are generated by the upgrade process, they cannot be edited (medium and small sizes). bugfix: plugin installer does not update version if plugin is already scanned. bugfix: single member selector style adjusted to look like multiple member selector. languages updated: tr_tr and fr_ca. bugfix: pagination in archived and trashed panels. bugfix: user and date information in archived and trashed panels is not shown. bugfix: ckeditor sometimtes puts an overlay that cannot be removed (when pasting links). bugfix: when viewing emails don't show attachments container if there are only inline attachments that are shown in mail body. bugfix: comments text area has a max of 13 lines. bugfix: cannot remove tags from users. bugfix: cannot edit some picture files. bugfix: non administrators can't link objects to template tasks when editing. bugfix: give a proper message when imap extension is not installed. bugfix: permissions components does not have horizontal scrollbar. bugfix: member panel children display issue fixed. bugfix: cannot download emails with .docx attachments if zip php extension is not installed. bugfix: when filtering by another dimension member the members that have parents are not included. bugfix: reminders are always saved to apply all the subscribers. bugfix: Deleting from project listing is not using the member controller delete function. bugfix: don't add contact member permissions for dimension_object and dimension_group object types. bugfix: single member selector on firefox. bugfix: send mail error when is called by cron and the sender is not the account owner. bugfix: member list order by parent name. bugfix: search on member trees is not working if the node name have html entities. bugfix: web documents only working for super admins. bugfix: workspaces and tags list not working. bugfix: when adding/editing suppliers the associated contact custom properties are not rendered and if there is any required cp the supplier cannot be added. bugfix: clear filter after select on member selectors. bugfix: filter dimensions by other dimensions does not get the filtered members always. bugfix: ensure that deprecated gantt overview widget is not rendered. bugfix: custom properties address fields renderization crashes when it has enters. bugfix: contact list image width. bugfix: template tasks parent id is not set in some cases. bugfix: set "attach document to notification" default value to "false"
bugfix: filters bug in linked objects picker. bugfix: custom report dates are not correct. bugfix: sharing table not updated for user when permissions changed. bugfix: dont set user images to expire today. bugfix: breadcrumbs on mail list. bugfix: some template tasks disappear from template view. bugfix: contact member cache is not recalculated when enabling or disabling modules. bugfix: non working days - remove option "leave as they are" and set min amount of days to 1.
bugfix: dont show member custom properties if plugin not installed. bugfix: dont show object in listings if it is only classified in a person member. bugfix: multiline text on street address. bugfix: missing contact data inputs in clients edition when client is a person. bugfix: langs in tasks groups. bugfix: user's widget in dashboard showing contacts. bugfix: related dimensions are reloaded with selected node object type not having an association. bugfix: Error when filtering tasks by tag. feature: resize columns on tasks list. feature: separate dimensions columns on tasks list. fetaure: allow to reorder and disable description and color fields (in custom properties administration). feature: description field for all type of members. feature: view object history paginated. bugfix: unclassified emails are not added to sharing table. bugfix: group totals on tasks list. bugfix: new mail old view from contact list. bugfix: blocking file for uploading new revision. bugfix: ensure that member template tasks are classified in the recently created member. bugfix: object prefix is not deleted after deleting object. bugfix: classify contact after change client parent. bugfix: mail view doesn't reload after classifying mail. bugfix: remember notify my self checkbox in add and edit file. bugfix: notify myself checkbox view in add and edit file. bugfix: notifications to asignee when creating and editing tasks. bugfix: update parent after adding child node on members trees. bugfix: mail rules history view. bugfix: not possible to upload picture when creating contact or user. bugfix: not showing which tab is selected in the mail panel. bugfix: phone number name with special characters. bugfix: language and css of installed plugins that are not activated are not included. bugfix: template milestone add is not modal. bugfix: calculate percent completed on tasks. bugfix: Superadmin cannot edit other superadmins. feature: generate template from mail - edit email fields - link mail to generated tasks. feature: calendar new event view when clicking on the calendar. performance: member trees paginated (left panel and selectors). performance: remove object timeslots permissions. performance: close timeslots when completing tasks. config option: number of previous pending tasks showing next to each task. config option: notification to subscribers when creating and editing tasks. bugfix: group totals aligned on tasks list. bugfix: error when instantiating template milestones. bugfix: showing which tab is selected in mail panel. bugfix: prevent "duplicate key" message in permission groups table when creating an user. bugfix: some checkboxes are not submitted correctly. fetaure: When editing a task and start or due date is changed, ask the user to advance/rewind the subtasks dates. feature: new config option to configure which address fields are mandatory. bugfix: when clicking home, the panel is reloaded once per enabled dimension. bugfix: when filtering tree by another dimension and selecting the node it is reloading again unnecessarilly. bugfix: remove comment and template objects types from role_object_type_permissions, max_role_object_type_permissions and contact_member_permissions. bugfix: object prefices - setting object name must escape characters. bugfix: linked objects component always filters by context, and intersects with the own member pickers selections. bugfix: when editing object, when cleaning object_members before adding to members, members of non-manageable dimensions must not be cleaned. bugfix: template instantiation with non-working days does not leave task dates as they are if advanced days are 0.
bugfix: don't classify "inline" attachments when classifying emails. bugfix: auto_classify_attachments config option is not included in mail plugin installer. bugfix: color input does not render "light grey" color. bugfix: project manager selector changes. bugfix: csv contact/company import encoding problem with iso-8859-1. bugfix: csv contact/company import fails if some fields has apostrophe. bugfix: csv contact/company import duplicates addresses, phones and webpages if import is executed twice. bugfix: custom properties with apostrophe can't be added to searchable objects. bugfix: linked objects and view as list in dashboard does not filter. bugfix: notification of previous task completed is the same as task completed. bugfix: contact selector langs are always in spanish. bugfix: tasks not showing in dashboard calendar widget. bugfix: uploading file with empty name. bugfix: mail panel navigation history. bugfix: when instantiating tasks from template in second step, subscribers are not copied changes: new function to centralize the copy of the subscribers, reminders, linked objs, members and custom props. bugfix: lang unknown group on tasks list for dates groups. bugfix: instantiate template parameters is not filtering by recently created member (when using member templates). bugfix: when adding/editing an email account, if a blank is after mail server address then cannot connect to mail server. bugfix: member custom properties values close div on active feed. bugfix: mail listing must not show emails that are not of my account and are not classified. bugfix: config option notify myself when uploading documents. bugfix: total pending time in tasks list. bugfix: add timeslot on task view not visible in root. bugfix: expenses, objectives and purchase orders where sending notifications before commit. bugfix: in community editions (tasks does not use time in dates) the reports are adding the timezone. bugfix: custom properties description in forms is not aligned. feature: allow to have companies and contacts with the same email address. feature: clients and projects listings allows to show custom properties and order the list by them. feature: check attach word with langs. feature: listing contacts with picture. feature: config option to allow choosing in which email field (to,cc,bcc) will the recipients be put when sending a notification. feature: config option changing name order to name surname. feature: config option remember working days preference in task's push. bugfix: updating percentage completed in tasks list. bugfix: returning to company view after editing contact picture. bugfix: number of archived objects. bugfix: style when changing order of deleted custom property. bugfix: remembering checkboxes in reports. bugfix: order by start date in tasks list. bugfix: saving documents without name. bugfix: refreshing read/unread ball colour in tasks list. bugfix: alignment in add event. bugfix: number of elements in trash. bugfix: when sending email to contact with comma in their name. bugfix: showing milestones options when disable in task panel. bugfix: plugin installers: dont give permissions in members that users doesn't have permissions for tasks (expenses, objectives, purchase_orders, income). bugfix: plugin installers: dont give permissions in members that users doesn't have permissions for tasks. bugfix: members of dimensions that dont use permissions are not shown in listings. bugfix: tags on memeber selectors. bugfix: contact custom properties on client edit. bugfix: when "adding objects without classifying": cannot create task if not filtering by member. bugfix: when grouping tasks by dim-members unclassified group is shown always however it has no tasks. bugfix: in additional member permissions. bugfix: when setting a project's client, the client contact is not classified into the project. bugfix: tab panel permission was not set when installing income plugin. bugfix: tasks report headers are wrong when grouping by priority. bugfix: when creating task repetition the subscribers are not copied from the original task. bugfix: when creating new client classify contact or company on the client. bugfix: error 500 when adding expense without payments. bugfix: when adding timeslot in "view all" no user is available. bugfix: events without invitation are not shown. bugfix: tasks workflow - only second step inherits templates variables. bugfix: prevent adding duplicated nodes in left panel trees. bugfix: task templates, only the first step works. bugfix: error 500 when colaborator edit a timeslot. bugfix: cannot edit root permissions when changing user type. bugfix: notes widgets is not cutting note text correctly. feature: user config option check attach word on mails. feature: modal view for classify email. feature: more read permissions for guest customers. feature: custom reports for dimension members. feature: confirm delete in members. bugfix: don't close modal on overlay click. bugfix: users can see all users profiles. bugfix: adapting image size on contact view. bugfix: user disappear from other users view after edit. bugfix: dynamic message when adding linked objects. bugfix: editting web document from view. bugfix: checking url when adding web document. bugfix: in income table definitions and queries. bugfix: save user permissions in background twice. bugfix: converting a contact to user loses custom properties and linked objects. bugfix: when editing an user and changing its user groups the member cache is not recalculated. bugfix: when creating user from contact, if all system permissions are removed, the default are added. bugfix: subscribers are lost if object is saved before the reload subscribers request returns. bugfix: duplicate phone on edit contact view. bugfix: mysql reconnect on executeAll. bugfix: "Cannot read property createChild of null" when adding a task and closing the modal form quickly. bugfix: in user groups permissions when applying permissions to all submembers of a workspace that has no children, the workspace is removed from the tree. bugfix: search input in listings has many bugs. bugfix: create user from contact view. bugfix: cannot export to csv custom reports with date_time custom properties. bugfix: draw located under selector only if member can have parent. bugfix: workspace description value is not rendered when editing a workspace. bugfix: breadcrumbs asking for members where user don't have permissions. bugfix: after add a contact on root. bugfix: can't remove "only working days for the tasks" on templates. performance: get imap mail function optimization. performance: update timeslots billing values is using too many objects and memory runs out if there are a lot of timeslots to update. bugfix: after add a contact in root. bugfix: after updating permissions for a user on a member, all objects on sub-members are deleted from sharing_table for that user. feature: dont use sharing table to check canView for individual objects. feature: instantiate task templates from email. feature: upgrade script change searchable_objects table to InnoDB if mysql version is  5.6 or greater. feature: checkbox to apply same permissions to submembers in edit member form, permissions modal form. feature: new table to define max member permissions by role. feature: send notifications grouped by language and timezone, max of 20 users x group. feature: invoicing repetition - repeat by fixed date. feature: When calculating task dates in templates and task push, do not count non-working days. feature: google calendar sync api v3. feature: notify assigned user of task A when A has a previous task B and B has been completed. feature: allow time inputs in date custom properties, only if crpm plugin is installed. feature: when instantiating template tasks check dates and if it is a non-working day execute the action defined in the template. feature: non working days abm. bugfix: when member filters associated dimension, get_child_members is not filtering. bugfix: when member filters associated dimension, if filtered member is clicked then the other dimensions are cleared and no member is selected. bugfix: when changing user role to a lower role, max permissions are not updated. bugfix: root permission are set to ext. collaborators. bugfix: nested transactions when saving mail. bugfix: contact export reloads the page. bugfix: export all contacts to vcard does not filter by context. bugfix: pagination in invoices listing. bugfix: config option "inherit_permissions_from_parent_member" was not inserted in installer. bugfix: when conditional task is automatically instantiated it is non added to sharing table. bugfix: if role cannot read object type the permission radio button is not hidden. bugfix: create task from email form is not modal and  does not autoselect the email's context. bugfix: template workflow - when tasks are automatically created, the parameters are not instantiated in the new tasks. bugfix: use post for get_members function. bugfix: breadcrumbs sometimes shows parent members that doesn't have permissions. bugfix: email download count fixed. bugfix: error when creating tasks. bugfix: contact export to csv. feature: System permission to let some users link objects. bugfix: performance when saving tasks, if it has subtasks can produce timeout. bugfix: notify myself when uploading files. bugfix: only context permissions are checked when adding a timeslot. bugfix: can_add function is checking for disabled dimensions. bugfix: missing linked objects types on the selctor. bugfix: add billing on timeslots when select stop clock on a task. bugfix: repeat event by fixed day is showing wrong dates for some events. bugfix: only context permissions are checked when editing a timeslot. bugfix: multiple file upload transaction broken by notifications. bugfix: at least one dimension must be selected on system modules. bugfix: add timeslot on tasks for user with permissions on the task context. bugfix: show tasks dependencies on gantt. bugfix: in edit task form, not all ' are escaped when drawing subtasks form. bugfix: task reminders are not sent for non administrators, task canView function was asking for logged user instead of using the user parameter. bugfix: dates variables on tasks templates timezone error. feature: scroll to comment after adding one. bugfix: if user has no permissions to see assigned to other user tasks he/she can view them in the calendar. bugfix: super admin cannot view all files. bugfix: remove from sharing table objects when user has no permissions to access objects without classification. bugfix: when adding a workspace, client, project or folder without parent and changing the parent in the form, the permissions are not inherited. bugfix: in user edition, user group names are not escaped and the form crahsed depending on the content. bugfix: upgrade scripts for expenses and objectives plugins, add max permissions for executives. bugfix: can not select empty milestones on tasks list. bugfix: when uploading an existing document, the list of files shows each file date 1 day after the real date. bugfix: email due date reminders shows company name instead of due date. bugfix: sql error when upgrading from feng 1.7.
bugfix: on tasks drag and drop the task loses its description. bugfix: load gantt if user config option is set to do that. bugfix: show subtasks on gantt. bugfix: show milestone due date on task list. bugfix: show empty milestones on task list fails when filtering by dates ranges. bugfix: cannot delete user groups. bugfix: cannot edit user data. bugfix: document is always attached to notifications. bugfix: email due date reminders does not show the date correctly. bugfix: forward mail not working in some cases. feature: upgrade by console - no need to pass the version from and version to parameters. bugfix: Users without permissions to add timeslots can add timeslots if the task is assigned to him/her. bugfix: In tasks list, in show menu, user has no time permissions but time option is shown, and are also shown the time links in task row. bugfix: In tasks list, if action popover button has no actions, it is shown with an empty menu. bugfix: Feng1 to Feng3 upgrade script does not fill the "enabled_dimensions" config option. feature: when classifying users using drag and drop the system asks if you want to add the default permissions for the users in the workspace where they are being classified. performance: tree node asks for childrens to the server twice after click. bugfix: on tasks list after add the first task remove  "There are no tasks in". bugfix: when composing an email with other email address the autosave asks if you want to send with that adddess (it must ask only when sending or saving draft). bugfix: When creating collaborators positioned in a workspace, the workspace is not added to the member cache, permissions are fine. bugfix: In upgrader script, if DEFAULT_LOCALIZATION not defined then define it with value "en_us". bugfix: If email account is set as default, then the "Sender name" field is ignored. bugfix: When adding an event checkboxes "subscribe invited users" and "send email notifications" are not working. bugfix: Duplicated tasks on tasks list in last month and last week when this groups are overlapping. feature: multiple status factors for each status. feature: add/edit billing category in modal form. performance: on tasks list view. bugfix: cannot upload logo when adding company or client. bugfix: cannot add company when creating a client with type=person. bugfix: unclassify user from members where permissions have been removed. bugfix: when replying an email and changing the "from" the mail content is lost. bugfix: calendar events only shows one member color (fixed for week and day views, must be activated in user preferences). bugfix: expenses plugin - totals row doesn't check permissions. bugfix: csv export should only export the contacts, users or companies if they are being shown in the contacts tab. feature: System permission to let some users change event invitations state for other users. feature: Added custom properties to choose a default status when creating a new project or client. feature: When creating a new client, you can now choose if its a company, a contact, or nothing. bugfix: Dimension Members with no creation application log were not displayed on the Dimension member list in the Administration panel. bugfix: Object members were not being displayed correctly, and when more than possible to display were added, "and 1 more" was not displayed. feature: New "Getting Started Wizard". bugfix: When uploading a file, blue button moves left and then returns to its original place. bugfix: When modal form is rendered and controller sends an error, screen is masked anyways. bugfix: Don't show radio buttons to delete/write if role cannot delete or write (e.g. : collaborators cannot delete som object types). bugfix: Collaborators and guests should not have root permissions. bugfix: check mail function make a lot of work if the last mail on the system is not on the server. bugfix: When uploading a file greater than max size, the file is created but without content. bugfix: If error occurs when uploading file always shows the same message 'Error uploading file'. bugfix: removed "fo_" prefix from queries. feature: Workspaces, tags, etc. selectors upgraded. bugfix: quick edit task timezone errors. bugfix: performance improvement on object listing query. bugfix: performance improvement on mail listing query. bugfix: superadmins should not see unclassified emails of other people. bugfix: Performance upgrade in initial loading. bugfix: When editing permissions don't load information for hidden components, load data when expanding them. bugfix: date custom properties does not allow blank values, and cannot be deleted. bugfix: in custom reports remove text styles and leave new lines. bugfix: enters in timeslots descriptions are skipped in time report and task view. bugfix: after add new members on the tree select them. bugfix: can not print monthly calendar. bugfix: expenses and objectives installer: new users permissions. language: translation tool upgrade: Link to checklang tool to list missing langs foreach language file. bugfix: UTF-8 issue in tasks descriptions in the tasks widget. bugfix: Transactions reorganized when saving permissions. bugfix: Required custom properties control fixed. feature: Added a permissions cache to improve left panel trees load times. feature: Initial loading performance improved. feature: Performance improved in "People widget" in overview tab. feature: Performance improved in "Activity widget" in overview tab. feature: Add flag by object for sharing table healing process. feature: Gantt full screen option. feature: Toolbar option to show/hide birthdays in calendar views. feature: Upgrade plugins after upgrading core using html interface (only if 'exec' php function is available). feature: Config option to allow (or not) new users to be granted with permissions over all existent workspaces depending on the user type. feature: Don't show popup when adding a new member. fetaure: Config option to decide if mail attachments are classified with the email. bugfix: Previous XSS fixes broke some post parameters (e.g. contact form). bugfix: If using a custom favicon, it is not used when printing an email. bugfix: Don't show "expiration_time" attribute in files reports (deprecated column). bugfix: Task descriptions cannot save character "|". bugfix: When composing an email and changing "from" sometimes the signature does  not refresh correctly. bugfix: Filtering tasks list by date, inputing the date manually does not filter the list. bugfix: Task descriptions overflow fixed. bugfix: Cannot import ical in a workspace if user doesn't have permissions in root. bugfix: Cannot print calendar month view. bugfix: Cannot export total tasks times report to csv. bugfix: performance when changing permissions. bugfix: login screen broken in IE 7.
bugfix: Composing emails with base64-encoded images are blank after sending them. bugfix: Template tasks names overflow. bugfix: Calendar views event overlapping fixes. bugfix: If tmp/logo_empresa.png exists, then use it in all notifications. bugfix: When configuring widgets, changing to other section resets options. bugfix: When creating admins permissions were not saved in background and not using cache for dimension object type contents. bugfix: Permission issue when disabling a tab and then removing permissions for some workspaces. bugfix: Tasks "assign to" was not filtering by task context. bugfix: Performance in get mails query. bugfix: Remove "related to" option when adding a user. bugfix: Clients and projects widgets fixes. bugfix: Task quick-edit workspace, clients and projects selectors fixed. bugfix: Task drag & drop error after deleting a task. bugfix: Ical feed for calendar does not work. bugfix: Superadmin not viewing all elements. bugfix: Cannot upload file in Internet Explorer when a filtering by a member. bugfix: When uploading files, use a generated name instead of filename to save it in tmp. language: Languages fr_fr (French France) and fr_ca (French Canada) improved. language: Added language en_gb (English U.K.). bugfix: send email inline images attached instead of the link to tmp folder. bugfix: ical feed does not work. bugfix: cannot upload file in IE when a filtering by a member. bugfix: task drag & drop error when grouping by milestone. bugfix: view day in calendar is not showing some tasks names. bugfix: line break in timeslots comments. bugfix: quick add task in milestone. bugfix: time report does not list results if a cp condition is added. bugfix: day calendar view show all task duration. bugfix: time reports grouping by clients & projects fixed. bugfix: time report - missing langs in group names when grouping by task. bugfix: edit person and company notes text box size. bugfix: when upload a new revision of a file keep old linked objects. bugfix: dont allow guest users to see other guest users. bugfix: custom report export to csv. bugfix: gantt undefined alert when a link task target is not present. bugfix: gmt errors in calendar when displaying tasks or dragging tasks. bugfix: when uploading a new revision of a file keep old linked objects. bugfix: members selectors combos breadcrumbs errors. bugfix: milestones gmt problems in calendar view date. bugfix: don't use gmt in task dates if config option Use time in task dates is  disabled. bugfix: day calendar view shows all tasks duration. bugfix: quick adding a task when grouping by milestone sometimes failed. bugfix: method_exists not working properly depending on php version if using a class method. bugfix: cannot download csv report in Internet Explorer. bugfix: time report date range shows the first day of actual month if "last month" is selected (data is correct, only date range info is showing this error). bugfix: refresh sharing table when root permissions are updated. bugfix: disabled users are not loaded in tasks list. bugfix: add clients and projects column to total tasks times csv export. bugfix: gantt crashes in ie. bugfix: function add_file_form_multi() doesn't exist, it should be add_file_from_multi(). bugfix: default contact config options with wrong values after upgrade. bugfix: task dependencies in templates did not show up correctly. bugfix: in calendar view the time line has a gmt error. bugfix: task quick add/edit alignment. bugfix: importing a contact csv does not send context when sending the file and permission query fails. bugfix: js error in save as button for documents, when comments are mandatory. bugfix: show custom property text fully. bugfix: filesystem permissions fix in some scenarios when uploading files. bugfix: when importing companies or contacts from csv. bugfix: time zone error on calendar view. bugfix: pagination error on time panel. bugfix: report date parameters are not formatted correctly the first time if they are not saved in contact config options. bugfix: In Overview, view as list pagination problems. bugfix: refresh Assigned to combo after selecting a member in quick add/edit task and in timeslots view. bugfix: main breadcrumb sometimes shows html chars. bugfix: select members combo missing members. bugfix: html in tiemeslots description. bugfix: can't add timeslots if members combos are not present. bugfix: city is not imported if contact has no address when importing companies or contacts from csv. bugfix: if config option 'checkout_for_editing_online' is enabled don't show button to upload new revision when editing a document. bugfix: several fixes in templates and tasks dependencies. bugfix: if gantt plugin is installed there are restrictions with start date in task dependencies. bugfix: delete task dependencies after delete task. bugfix: don't show trashed or archived milestones in milestone combo. bugfix: when viewing a note or task and text is html and has no enters, text overflow is visible and goes over other html, it should break word. bugfix: When edit timeslots show all members. bugfix: Error occurs sometimes when attaching files to send mails. bugfix: Several "undefined variable" fixes. bugfix: Non utf-8 characters in custom reports produces an error when rendering. bugfix: After deleting a folder the top breadcrumb is not refreshed correctly. bugfix: Missing langs in document report columns. bugfix: When classifying emails a new revision is generated always for every attachment. bugfix: Attribute title not escaped in reports when renedering object links. bugfix: Workspace selectors are not preloaded in time panel. bugfix: add web document  fail if have http in the url. performance: When classifying emails classify attachments in background. bugfix: gantt subtasks of subtasks not displayed. bugfix: mysql error when edit mail account. bugfix: search on dimensions doesn't work with files. bugfix: getDaysLate and getDayLeft tasks functions fixed. bugfix: delete repeat number of times if "This Day Only" is selected on repeatinig tasks. bugfix: fo_ prefix table hardcoded. bugfix: templates errors when edit tasks. bugfix: milestones problems on template task. bugfix: can't add milestones in template task from edit. bugfix: mail plugin update failed if column conversation_last exists. bugfix: task dates are not shown with user timezone in custom reports. bugfix: logged user is not subscribed when uploading a file in the object picker (linked objects). bugfix: tasks widget shows tasks 1 day earlier for some user timezones > 0.
bugfix: reload view (to show checkout information) when download and checkout in the same request. bugfix: in extjs when reloading combos. bugfix: if no member selected, in total tasks times report parameters, show all users. bugfix: separate transactions for saving user permissions. bugfix: multiple file upload enabled when uploading a new version. bugfix: Cannot edit unclassified timeslot. bugfix: Bug when classifying email and attachments has no name. bugfix: Add weblinks in documents panel. bugfix: Total task times performance improvements. bugfix: Message changed when trying to add objects in root with no permissions. bugfix: If member name contains "'" advanced reports are broken. bugfix: Allow managers and administrators to add reports in root even if the don't have permissions to add reports in root. bugfix: Wrong date on activity widget if there are several changes on an object. bugfix: Selecting contact in contact tab must not filter by the contact dimension member. bugfix: Users and contact have the same icon. bugfix: Breadcrumbs are not shown for users. bugfix: Encoding fixed when saving files to filesystem. bugfix: When changing dimension member parent, breadcrumbs are not reloaded correctly. bugfix: Performance improvements in activity widget. bugfix: Cannot delete task description from quick-edit. feature: Add 'can_manage_tasks' permission to executive users. feature: Use "on duplicate key update" in DataObject insert queries, if specified. bugfix: can't view object link in notification when an email does not have a subject. bugfix: Template view broken by single quote in property name. bugfix: when edit a template if have milestones you can't see tasks. bugfix: don't show members that cannot be used in member selector. bugfix: Tasks grouping by dimension fixed. bugfix: Imap folders are not saved when editing an email account. bugfix: Cannot unclassify mails from classify form. bugfix: Emessage not shown when inputing dates with incorrect format. bugfix: Add start date to task view. bugfix: Get tasks by range query does not include logged user's timezone. bugfix: In task complete edition form, assigned to are not displayed correctly. bugfix: Issue in include myself in document notifications. bugfix: Set db charset when reconnecting in abstract db adapter. bugfix: Add attachments column in queued_emails in upgrade scripts. bugfix: Render member selectors with preloaded member info. bugfix: Order by name doesn't work on object list. bugfix: People widget only display users. performance: Issue when loading persons dim. bugfix: if a file doesn't have a revision, when classifying an email create one. bugfix: when adding a timeslot by clock on tasks, task progress bar was not updated correctly. bugfix: fixed custom reports using boolean conditions in false. bugfix: problems with paging on the overview list. bugfix: on activity widget, when clicking on a member, change dimension. bugfix: Don't send notification when add mail. bugfix: Emtpy trash can was using a deprecated function with performance issues. bugfix: Missing parameters in function invocation. bugfix: can't delete template task, permission denied. bugfix: langs customer_folder and project_folder. bugfix: can't add contacts from mail. bugfix: on activity widget move action don't display. bugfix: when create user, notifications break mysql transaction. bugfix: cron process to emtpy trash can does not delete members asociated to contacts. feature: error message improved when upload limit is reached. feature: contact custom reports - added columns for address, phones, webpages and im. feature: config option to add default permissions to users when creating a member. feature: templates have been greatly improved: they have changed completely for good! feature: when sending an email, if a word containing attach is found and no attachment if found, it triggers an alert. feature: update plugins after running upgrade from console. feature: add root permission when creating executive or superior users. bugfix: on gantt, names of the tasks were not displayed completely. bugfix: on gantt, the time estimation for tasks was not displayed correctly. bugfix: date custom properties default value does not use user's timezone. bugfix: on people widget add user combo is not ordered by name. bugfix: on activity widget dates have gmt errors. bugfix: general search allways search for empty string. bugfix: url files are not saved correctly when url is not absolute. bugfix: imap fetch fixed when last email does not exists in server. bugfix: only invite automatically the "filtered user" when adding a new event, not when editing an existing one. bugfix: variable member_deleted uninitialized in a cycle, maintains the value of previous iterations and fills the log warnings. bugfix: don't display group-mailer button if user doesn't have an email account. bugfix: allow mail rules for all incoming messages, useful for autoreplies. bugfix: the invitations of the events created on google calendar will have the same special ID of the event. bugfix: Users are now shown by default in the People tab. bugfix: on general search prevent multiple form submit. bugfix: custom reports, csv and pdf export only exports the active page..now it exports everything! bugfix: don't collapse task group after performing an action to the task when group is expanded. bugfix: don't classify email in account's member if conversation is already classified. bugfix: tasks assigned to filter doesn't filter correctly when logged user is an internal collaborator and users * can add objects without classifying them. bugfix: When creating members, do not assign permissions for all executives (or superior users) if member has a parent. feature: Field "Is user" added for people custom reports. feature: Users permissions can be configured to leave objects unclassified and choose the users that can read/write/delete these objects. feature: Improved member panels loading. feature: Only administrators can change system permissions. feature: Users can change permissions of users of the same type (only dimension member permissions). feature: Set permissions to executive, manager and admins when creating a new member. performance: Save permissions asyncronically when saving member to improve performance. performance: Insert/delete into sharing table 500 objects x query when saving user permissions. bugfix: Cannot filter overview by tag. bugfix: Tasks tooltip in calendar views shows description as html. bugfix: Permissions issue when editing and subscribing for non-admins for not classiffied objects. bugfix: When requesting completed tasks for calendar month view, it does not filter by dates and calendar hangs if there are too much tasks. bugfix: Administration / dimensions does not show members for dimensions that don't define permissions. bugfix: Permissions fix when email module is not installed. bugfix: Company object type name fixed. bugfix: Try to reconect to database if not conected when executing a query (if connection is lost while performing other tasks). bugfix: When users cannot see other user's tasks they can view them using the search. bugfix: Group permissions not applied in assigned to combo (when adding or editing tasks). bugfix: Minor bugfixes in 1.7 -> 2.x upgrade. bugfix: Activity widget: logs for members (workspaces, etc.) were not displayed. bugfix: General search sql query improved. bugfix: Don't include context in the user edited notification. bugfix: Don't show worked hours if user doesn't have permissions for it. bugfix: Don't send archived mails. bugfix: Archiving a submember does not archive its objects. bugfix: Error 500 when adding group. bugfix: Modified the insert in read objects for emails. bugfix: Minor bugfixes in document listing. bugfix: root permissions not set when installing new feng office. bugfix: Person report fixed when displaying email field. bugfix: contacts are always created when sending mails. bugfix: Tasks list milestone grouping fixed. bugfix: When ordering tasks and subtasks and grouping by some criterias. bugfix: ul and ol (list) on task description doesn't show number or bullet. bugfix: Don't update email filter options when reloading email list if they are not modified. bugfix: Eail polling only when browser tab is active. bugfix: Wait time interval to check an email account. bugfix: Workspaces widget to the left. bugfix: When creating workspace it is not selected if it isn't a root workspace. bugfix: Update objects when linking to others, from user_config_option to config_option. bugfix: Calendar dalily view puts other days tasks. bugfix: Fixes of undefined variables logged in cache/log.php. bugfix: Call popup reminders only from active browser tab. bugfix: Format date funcions did not use config option for format. bugfix: Username is not remembered when creating a new user. bugfix: People widget is not displayed. bugfix: When unzipping a file the name has the url first. bugfix: On Trashed Objects breadcrumbs are not displayed if members are archived. bugfix: When add a timespan on a task was always taking logged user id for billing. bugfix: Time zone bug on list task in a range of dates. bugfix: Last login not saved into data base. bugfix: Google calendar synchronization bug fixes. feature: View Contacts direct url if config option is enabled. feature: The system now remembers whether you are displaying the Overview as dashboard or as list. feature: Gantt sub tasks can be out of range of parent task dates. feature: Gantt chart and Task List can be filtered by period. feature: Comments are now displayed on Activity Widget. feature: archive/unarchive dimension members from administration->dimensions. feature: when uploading a file with the same name as another that has been uploaded by other user and you don't have permissions over it, don't show as if exists. performance: when saving members save permissions using an async request. bugfix: When adding users username field is not used. bugfix: In Archived Objects breadcrumbs are not displayed if members is archived, same happens in Trash can. bugfix: Synchronization with google calendar now deletes old events using "cancelled" status. bugfix: In some places don't display dates with the format of the config option(military time). bugfix: Duplicate key inserting read objects solved. bugfix: When writing an email from email tab, bcc was always displayed. bugfix: Events report end date did not show the time, now they do. bugfix: Objects history was not displaying linked objects logs. bugfix: On task list when you filter by a range of dates permissions filtering were not applied. bugfix: Exchange compatibility option has been removed. bugfix: When listing tasks timezones were not being taken into account. bugfix: Last login field was not being updated. bugfix: Gantt chart was showing some tasks as completed when their percentage was over 100% and they were not completed. bugfix: When adding a timeslot for someone else within a task, the billing value was not being taken into account. bugfix: Gantt chart tasks resizing has been improved. bugfix: Worked time was not always displayed. bugfix: Group by on tasks lists, subtasks displayed in wrong place. bugfix: Sort listings by custom properties(contact, document) . bugfix: Activity Widget broken on small screens. bugfix: Activity Widget time zone issue. bugfix: Custom property, escape commas. bugfix: Search contacts by phone number, email , im and by address. bugfix: add_to_members when no permissions over parent . bugfix: Duplicate key when adding emails to searchable objects. bugfix: User with permissions to edit account cannot delete unclassified emails. bugfix: projects widget does not show projects. bugfix: Sql was not using "select distinct" on searchable objects(). bugfix: add task dependency js error . bugfix: ObjectController::list_objects malformed sql error. bugfix: Now all users can sync Feng Calendar with Google Calendar. bugfix: Description not set for all tasks when listing. 21 May 2013 - 84MBChangelog unavailable at the time of release. bugfix: Add/edit member form permissions goes down if screen is not wide enough. bugfix: Member selector onblur must select one of the list if there is any match and there is at least one character written. bugfix: D&D classify is allowing to classify in read only members. bugfix: Do not show parent members in member selector if user has no permissions over them. bugfix: Upgrade 1.7 -> 2.X: give permissions over timeslots, reports and templates in all workspaces where the user can manage tasks. bugfix: Non admin users cannot delete timeslots. feature: Can define required dimension without specifying object types. feature: Option to view members in a separate column. bugfix: Cannot delete user with no objects associated. bugfix: Email content parts that come in attachments are not shown. bugfix: Tasks edition in gantt chart loses task description. bugfix: Adding client or project under another member does not remember selected parent when using quickadd and details button. bugfix: Cannot add user without password if complex passwords are enabled. bugfix: Include ";" as metacharacter for complex password validations. bugfix: Member name is username when adding a contact (editing contact fixes member). bugfix: Change logo link does not work. bugfix: fo_ table prefix hardcoded one time. bugfix: Calendar tasks display fixed. bugfix: Always check if member can be deleted. bugfix: Cannot delete mail account with mails. bugfix: Add contact was checking if user has can_manage_security. bugfix: Cannot select parent member using checkboxes. bugfix: Error 500 in some notifications. bugfix: New client/project from overview fixed. bugfix: Breadcrumbs only show 2 members x dimension. bugfix: Total tasks time reports csv export does not work. bugfix: Fix en clculo de porcentaje de avance de tareas. bugfix: Forwarding or replying mails in German only prints "null". bugfix: Activity widget popup wider to put all buttons in one line. bugfix: Users in assign_to combo are not ordered. bugfix: 1.7 -> 2.x upgrade does not create table mail_spam_filters. bugfix: Tags are lost when dragging a task to another workspace. feature: More options for tasks edition. feature: More options for composing emails. feature: Compose mail get contacts by ajax. feature: Custom properties columns in documents tab. feature: No breadcrumbs for users in activity widget. 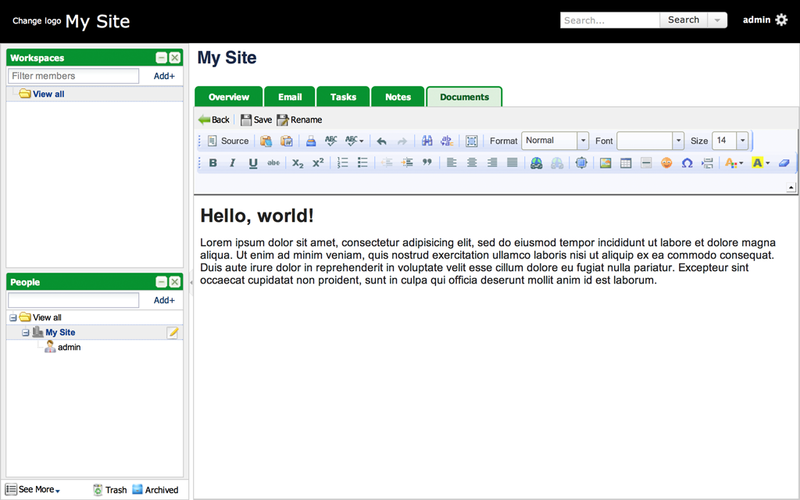 feature: Ckeditor option added: remove html format. performance: Delete account emails performance and memory usage improvements. language: Deutch, Russian, Ukranian, Portuguese, German, French, Japanese, Polski and Indonesian language updates. bugfix: Search in a member does not find file contents. bugfix: Click on "search everywhere" does not find file contents. bugfix: Groups listed alphabetically in the Administration Panel. bugfix: Monthly view calendar print shows empty calendar. bugfix: Improvements in performance of overview widgets. bugfix: Timeslots are not reclassified reclassifying tasks. bugfix: Cannot delete members if it has objects. bugfix: Member deletion does not clean all related tables. bugfix: Only managers or superior roles can change other user passwords. bugfix: Several missing langs and undefined variables warnings clean. bugfix: Db error when adding two workspaces with the same name. bugfix: Quick add files - all radio buttons can be selected. bugfix: Owner company cannot be classified. bugfix: Task list group by user fix. bugfix: Add pdf and docx files to searchable objects. bugfix: Cannot edit/delete mails from deleted accounts. bugfix: Error in tasks reports when ordering by 'order' column. bugfix: Fixes in migration from 1.X of custom properties. usability: Reports can be edited to allow execution in every context. usability: Performance improved in tasks list. usability: Users are filtered by permissions in 'People' dimension when filtering by a workspace. usability: Contacts are filtered in 'People' dimension when filtering by a workspace if they belong to the workspace. bugfix: go back instead of redirect when editing file properties. bugfix: Cannot manage plugins if no super admin. bugfix: Reports were not grouping unclassified objects. bugfix: Reports grouping misses a group. bugfix: Fixed findById function in ContentDataObjects. bugfix: Fixed Email plugin installation. bugfix: Fixed translations for dimension names. bugfix: Error with company logo when sending notifications. bugfix: Time report fix when selecting custom dates and listing paused timeslots.